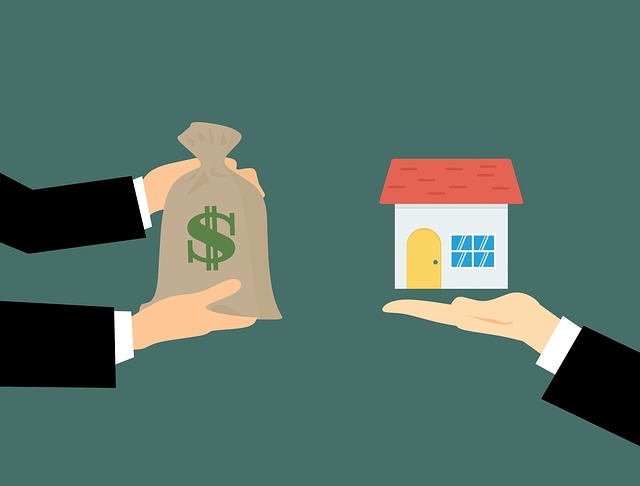 There are a bunch of terms used to refer to the individuals authorized to mediate between the buying and selling of property. If you want to buy/sell a property, you will need a representative to undertake the transactions. You will need to either choose a real estate agent or a realtor. Real estate agents are also known as sales associates/salesperson. They are the people licensed to represent either buyers or sellers during a real estate transaction. 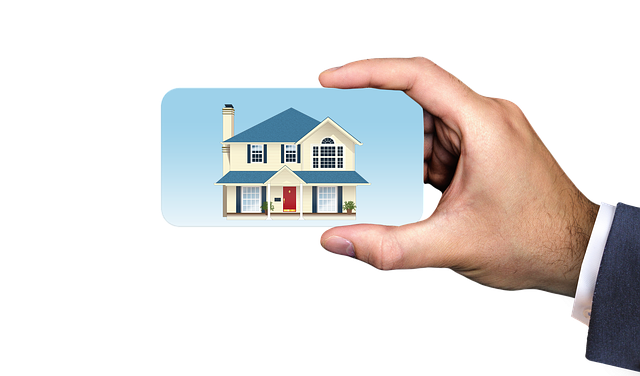 A realtor is an individual authorized to mediate between the real estate transaction, and, has to be a member of the recognized association in the region. For example, in the US, there is the National Association of Realtors. A real estate agent is a real estate representative. He/she represents the buyer or seller and ensures their related property needs are met. In the US, real estate agents are known as real estate sales associates. Real estate agents have the option of obtaining licenses from the government authority to ensure their operations are legally recognized. To acquire the license and certification, they undergo a couple of tests. Some states will also require background checks and business insurance from the applicants. The permits also have jurisdictions, which means the holder can only operate within the specified region. Some agents operate successfully without the certification and maintain the same title. However, due to competition and the industry’s environment where success is often based on reputation, many opt for the state-issued licenses. A pledge to put buyers and seller’s interests above their own and be honest with all parties. Avoid exaggerations, misrepresentations or concealing of substantial facts about the subject property. He/she is obliged to investigate and disclose when issues have a reasonable warrant. To cooperate with all other brokers when it best suits the clients. The guidelines address the duties of the realtor to clients, the general public and other realtors. If any realtor is found guilty of violating any of the codes, they risk removal from the association. This membership certainly holds the realtors to a higher standard. Realtors must be members of an association. In the US, there’s the National Association of Realtors. Real Estate Agents are not subjected to any form of membership. Realtors must submit to a specific code of ethics. Failure to oblige to the guidelines will result in withdrawal of the association membership and the issued license. Real estate agents don’t have a set of ethical codes guiding their operations, however, have to ensure their actions are legal and authorized within their jurisdiction. Realtors have to pay higher fees for both the association membership and licences. These fees are paid annually. For NAR, the current charges stand at $120, for new applicants the costs can go as high as $250. Real estate agents only pay the licensing fees. Realtors must continuously undergo training throughout their careers. They have no choice but to keep up to date with trends, popular practices, changes in law and education level. Real estate agents are not subjected to improve their skills through training regularly, most do it voluntarily. The easiest way to differentiate between a realtor and a real estate agent is to look at their business cards. Realtors have an additional badge of honor on their cards trademarked with the realtor symbol. The cards of real estate agents don’t feature any of this. Realtors and real estate agents are legally recognised as mediators during real estate transactions. They both represent buyers and sellers of property. Realtors are required to be members of an association like the National Association of Realtors. Real Estate Agents are not obliged to join any association. 17 guidelines in the code of ethics govern all operations by realtors. Failure to adhere to them results in membership termination. There is no given code of ethics for real estate agents; their actions are guided by their integrity. Realtors have to undergo training throughout their career continually, however, real estate agents don’t. Being a realtor will cost you more in yearly fees than being a real estate agent. Evah Kungu. "Difference Between Real Estate Agent And Realtor." DifferenceBetween.net. 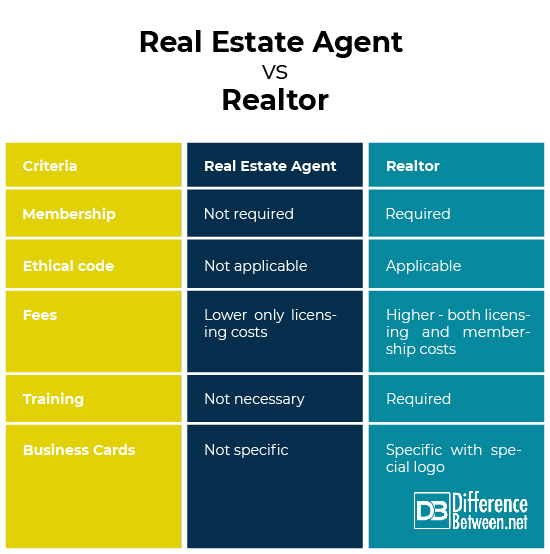 August 9, 2018 < http://www.differencebetween.net/business/difference-between-real-estate-agent-and-realtor/ >. Jannatpour, M. (2016). The Honest Real Estate Agent: A Training Guide for a Successful First Year and Beyond as a Real Estate Agent. CreateSpace Independent Publishing Platform. Newman, D. (2016). Part Time Real Estate Agent Startup: How I Went from Bartending to Be a Successful Realtor. CreateSpace Independent Publishing Platform. Freedman, R. (2005). Broker to Broker: Management Lessons From America’s Most Successful Real Estate Companies. John Wiley & Sons.